If I thought I was done and dusted with all that science fiction had to offer with Herbert and Asimov, I was in for a surprise. What it lacked in grandness of scope, Ender’s Game easily made up in pace. The book was truly a page turner that begged to be read in a single sitting. This book is set in the near future within a century of our times and focuses on a set of individuals and a specific event rather than taking us through a broad sweep of events in the imaginary future history of mankind. The premise of the story is around humans foiling the first wave of an alien attack due to a lucky break and getting a period of reprieve to prepare for the second wave of the alien attack. The story revolves around a battle school set up for training strategists to lead the battle against the aliens. One might ask what is so special about a military training camp – we have so many books and movies on them. What is special is that the recruits are not adults but children. Children as young as eight years. And the focus is not on developing physical prowess but identifying talent and nurturing skill in strategy, tactics and rapid decision making. After all what value is physical strength in the age of nuclear missiles, robotic drones and biological weapons where all that a human warrior needs to do is to press a few buttons? The protagonist is one of the boys in the school who is to be the supreme commander and the story takes us through his journey towards the top culminating in the final showdown with aliens. The overall story line is bit of a cliché. For instance you could take Harry Potter and replace Harry with Ender Wiggins, magic with blasters and space ships, Dumbledore with Colonel Graf, Quidditch with the practice battles at battle school, Voldemort with Aliens. And presto! We have Ender’s Game. But the thing about this book is not the novelty of plot. What I enjoyed most were the various challenges Ender encounters at the battle school and the innovative approach he uses to resolve each one of them. Also interesting is his struggle with the inner demons of his mind which holds the key to his success during the final battle against the aliens. The book offers a lot of interesting insights on group psychology, strategy, team building and leadership. I found the very idea of the Battle School itself quite interesting as well. When I watched the cult classic anime Cowboy Bebop few years down the line and heard Jet Black say, “There’s nothing more pure and cruel as a child”, Ender’s Game was the first thing that came to my mind. The whole idea of Battle School is built on this philosophy – that a child’s innocence gives the child immense power to commit acts of terrible cruelty without any hint of the hesitancy or remorse that the conscience of a more experienced mind brings to bear upon its owner. The very idea of association of cruelty and ruthlessness with childlike innocence may seem counter intuitive. But haven’t we often seen children commit atrocities upon insects and small animals with no inkling of the pain they are putting the hapless beings through? We can also see this element of a cruelty streak in children or childlike individuals in William Golding’s ‘Lord of the Flies’ and John Steinbeck’s ‘Of Mice and Men’. Working on this philosophy, Battle School catches children before they are socially conditioned and develop a sense of right and wrong and hone them into ruthless leaders who can do anything to achieve their end objective. The logic being that only such ruthlessness can defeat the powerful aliens and save humanity. The third interesting element in this story is a sub plot around Ender’s vicious elder brother Peter and his sister Valentine. It has Peter emerging as a demagogue on the internet along with Valentine and managing to develop so much influence that he emerges as a world leader. This story thread had so much influence on me that I actually imagined that I too would be able to pull off what Peter did through my blog and participation in online forums. This happened to be one of the initial reasons for starting my blog. From the story point of view though, while I found it interesting, I somehow felt it did not blend well with the main story and stood apart like a sore thumb. This book is part of a series that has eleven books. But actually it can be considered as two series with Ender’s Game being the common starting book. One series, starting with ‘Speaker for the Dead’ features an older repentant Ender Wiggins and explores the thread of ethics, morality, brutalities of war and inter species relations. This series goes a bit slow on pace and deep on philosophy. Strategic elements also are lesser while one can see lot of innovation in world building and alien species creation. The second series, starting with ‘Ender’s Shadow’ follows through the thread of Peter Wiggin’s influence on world politics and has the strategic elements from ‘Ender’s Game’. This series is more pacy and probably the true successor of ‘Ender’s Game’. Ender’s Shadow actually runs on a timeline parallel to Ender’s Game and follow the adventures of a seven year old Bean and his battle of brains against his arc nemesis Achilles, also a child prodigy. So technically it can be considered a completely different series starting with ‘Ender’s Shadow’ as well. Overall, this series is closer to mainstream fiction than most other science fiction. 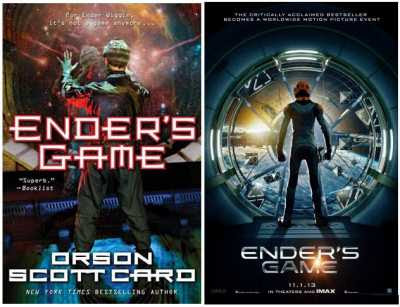 People who like detective stories and thrillers will enjoy Ender’s Game and the Bean Saga. The series starting with Speaker of the Dead may find resonance with the more serious reader who looks for depth. Needless to say the science fiction buff can’t afford to miss either of the arcs. Hope you liked Ender's Game. His other books are also worth a read. But actually they do torture ants and all, no? There was a boy who jabbed a sharp pencil into my eyes. I remember pouring boiling hot water on an ant to see what happens. I have seen the movie, wasn't too impressed by it, but will try and read Ender's game. I am really glad that SF is a genre you like! I am always more a SF guy than Fantasy guy, Ramesh. You should read it. Not all books are made into equally awesome movies, especially ones that are more brain based and less of visuals.